Amazon is on top. On Monday, it surpassed Microsoft to become the largest publicly traded company in the U.S. by market cap, with a current valuation of $789 billion. Apple, its fierce competitor, has fallen to fourth place, trailing both Microsoft and Alphabet. That's good news for Amazon investors, especially those who bought stock early on. If you had invested $1,000 in the tech company in early January 2009, your initial outlay would be worth more than $28,356 as of January 2019, according to CNBC calculations. And the ecommerce giant is expected to see shares surge more than 20 percent in 2019, according to a new report from Pivotal Research Group. While Amazon's stock has performed well, any individual stock can over- or under-perform and past returns do not predict future results. 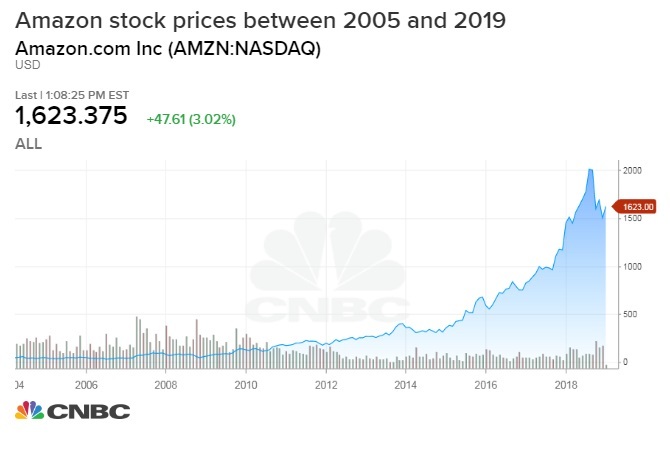 Amazon's stock prices as of January 7, 2019 at 1:09 p.m. ET. In the research note published Monday, analyst Brian Wieser predicted a $1,920 year-end price target for the retailer. That would mark a 21 percent rise in the price of the company's stock and put Amazon's valuation close to $1 trillion. "Despite its current massive size, we see Amazon's opportunities as mostly unconstrained based on a successful track record of capitalizing on consumer and IT department spending," Wieser wrote. The research note forecasts that Amazon's digital advertising business will continue to be a major source of revenue growth. In 2018, the sector grew more than 70 percent and earned Amazon the third-most digital ad sales for the year, behind only Google and Facebook, according to market research company e-Marketer. Amazon's Prime service, which increased its price from $99 a year to $119 in May 2018, now reaches 100 million members worldwide, founder and chief executive officer Jeff Bezos announced in his annual letter to shareholders. Bezos's net worth is now more than $134 billion. "Amazon's share in its key markets continues to expand," Justin Post, an analyst at Bank of America Merrill Lynch, wrote in an April 2018 note to clients. The company's "success is supported by strong fulfillment infrastructure and Prime lock-in." Amazon surpassed $900 billion in market value last July, although it hasn't yet managed to join Apple in hitting a $1 trillion market cap. If you're looking to invest in the next Amazon or considering putting some money in the stock market, experienced investors like Buffett, Mark Cuban and Tony Robbins suggest you start carefully. Begin with index funds, they say, which hold every stock in an index, offer low turnover rates, attendant fees and tax bills, and fluctuate with the market to eliminate the risk of picking individual stocks.